George Arthur Gimson, the second son of Arthur and Annie Gimson, was born on 6th January 1899 and, as a young boy, he lived at No 6 The Poplars, off Wollaton Road, Beeston, with his parents, brothers and two sisters.2 At the age of five he attended the Church Street Infants School, and later he went on to further his education at the Nether Street School for Boys3. He left school on 21st December 1911. The family later moved to 198 Queens Road, Beeston and, while living there, George Arthur enlisted at a Nottingham Recruitment Centre where he joined the 4th Battalion Sherwood Foresters in August 1914 at the age of fifteen. He was discharged after a short time when he was discovered as being under age. He later re-enlisted under a false name and was excepted in the 3rd Reserve Battalion, again with the Sherwood Foresters5. After his training he was posted to Sunderland where he remained until being sent to the Dardanelles after the Suvla Bay landings in August 1915, remaining there until the Sherwoods were withdrawn, when he went with the 9th Battalion to Egypt. He remained in Egypt until early 1916 before he left for France where he transferred to the 10th "Service" Battalion Sherwood Foresters on his arrival at the front in France, his new battalion having been raised at Derby on the 13th September 1914. The battalion were eventually formed with the 7th Battalion Lincolnshire Regiment, 7th Battalion Border Regiment and the 8th Battalion the South Staffordshire Regiment which formed the 51st Brigade of the 17th Division. The 10th Battalion lost the whole of "C" Company towards the end of August 1914 when they were posted en bloc to the 12th Pioneer Battalion. After training, the 10th Battalion left its last camp at Winchester, arriving by train at Folkestone, before boarding a ship for France. The battalion landed at Boulogne in the early morning of the 15th July 1916 to prepare for duty to their country. Private Gimson had been on the Western Front less than a month when he was wounded in action during the August Somme Battle.The battalion was holding the line from Longueval to the north east of Delville Wood. Conditions within the wood - shell holes everywhere and dense root growth - made it impossible to dig trenches. The 10th Sherwood Foresters attacked the enemy positions, just inside the wood in front of the 7th Border Regiment, without success as the enemy had good support from unlocated machine guns somewhere in a corn field. However "C" & "D" Companies managed to establish posts on the left of the attack. Another attack was ordered at midnight but this attack was also unsuccessful. It was during this operation that was Private Gimson was wounded and died the next day, the youngest member of the 17th "Nottingham" Beeston, Company Boys Brigade to make the Supreme Sacrifice during the Great War.. Also killed in this attack was another Beeston Boys Brigade pal, Private Harold Lee. 2His parents, Arthur Edward Gimson (b. c1868) and Annie Adelaide Dobson (b. c1867) married in 1892 in Nottingham. His father was working as a wood carver in 1891 and living in Sneinton, Notts. The family has not been located on the 1901 census. 3He appears in the school Admission Register as No 3618, on 1st August 1906. 4Alfred is shown in the 1918 Absent Voters list at 198 Queens Road serving as 64527 Driver, 2nd Section, 2nd D.A.C; Royal Field Artillery, also serving from this address was a James William Howieson TR/6/8107 C.Q.M.S. 53rd (YS) Btn, T R Notts & Derby’s. 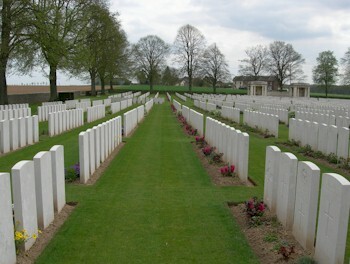 5The record of the death of Private Gimson was only found after acquiring a copy of the Delville Wood Cemetery Register from the Commonwealth War Grave Office, and searching through every page.